What Day Of The Week Is December 31? 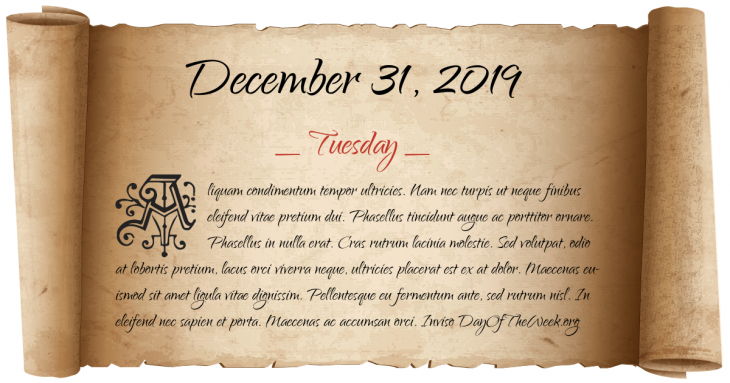 December 31, 2019 is the 365th day of the year 2019 in the Gregorian calendar. The day of the week is Tuesday. It is widely known as New Year’s Eve since the following day is New Year’s Day. It is the last day of the year. Queen Victoria chooses Ottawa, Ontario, then a small logging town, as the capital of Canada. The farthing coin ceases to be legal tender in the United Kingdom. In Nigeria a coup d'état led by Major General Muhammadu Buhari ends the Nigerian Second Republic. This date is skipped altogether in Kiribati as the Phoenix Islands and Line Islands change time zones from UTC−11:00 to UTC+13:00 and UTC-10:00 to UTC+14:00, respectively. Five hijackers, who had been holding 155 hostages on an Indian Airlines plane, leave the plane with two Islamic clerics that they had demanded be freed. Who were born on December 31?